› Author Affiliations Funding Editorial support was funded by Bayer AG. Real-world data are a well-recognized component within the drug lifecycle, and such data are generated from a range of sources and study designs, including claims databases, electronic health records, non-interventional studies (NIS) and registries. While this information can be of vital clinical importance, there may be challenges in understanding the relevance of the differing study designs, endpoints and populations. Here, we summarize the value of real-world evidence and considerations pertinent to their use in clinical research. Owing to the variety of analyses being conducted using real-world data, it is important for researchers and clinicians to have a clear understanding of the nature and origin of those data, and to ensure they are valid, reliable and robust in terms of extrapolating meaningful findings. There are crucial questions to address when evaluating real-world studies, and we introduce a checklist to meet these objectives. In addition to advice for appraising data quality and study designs, several updates will be covered from real-world studies of rivaroxaban for stroke prevention in patients with atrial fibrillation (AF): the nationwide Danish cohort study, U.S. Department of Defense Military Health System database, retrospective claim database study REAFFIRM and a pooled analysis from the global NIS XArelto on preveNtion of sTroke and non-central nervoUS system systemic embolism in patients with non-valvular atrial fibrillation (XANTUS). 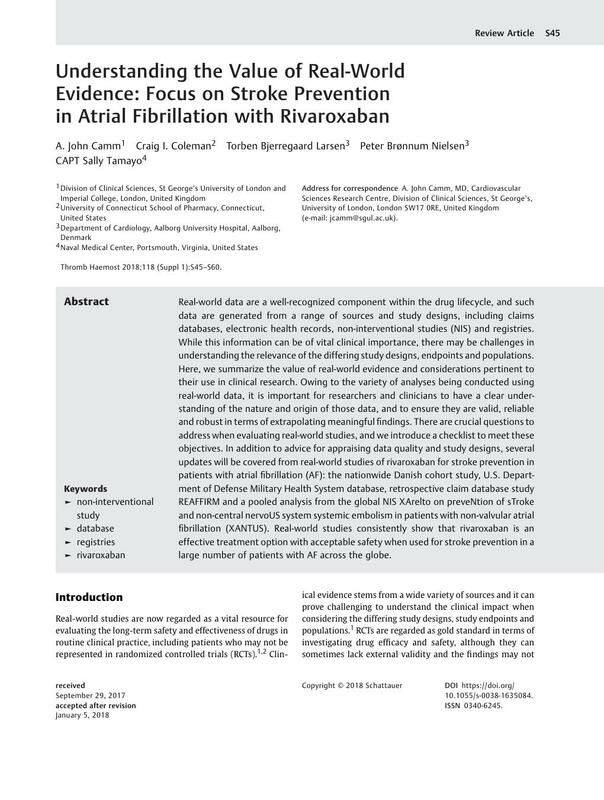 Real-world studies consistently show that rivaroxaban is an effective treatment option with acceptable safety when used for stroke prevention in a large number of patients with AF across the globe. CAPT Sally Tamayo is a military service member. This work was prepared as part of her official duties. Title 17 U.S.C. 105 provides that ‘Copyright protection under this title is not available for any work of the United States Government’. Title 17 U.S.C. 101 defines a United States Government work as a work prepared by a military service member or employee of the United States Government as part of that person's official duties. U.S. DoD MHS research data derived from an approved Naval Medical Center, Portsmouth, VA IRB protocol (NMCP.2013.0021). The views expressed in this manuscript are those of the authors and do not necessarily reflect the official policy or position of the Department of the Navy, Department of Defense or the United States Government.